Every musician is individual, and your instruments need to complement your creativity and performance style. The SPD::ONE KICK lets you play the way you want to; this compact digital percussion pad can be played with drumsticks, hands, or even your feet. What’s more, you can adjust sensitivity and trigger threshold settings in seconds simply by using two control dials on the side of the unit. Drummers and percussionists will love the solid feel and natural rebound, guitarists can confidently stomp on the unit for four-on-the-floor beats, and practically any musician can play sounds by hand without fear of sore palms and fingers at the end of the night. The SPD::ONE KICK contains 22 internal sounds, including a variety of kick drums and stomp box sounds, making this the ideal pad in the SPD::ONE range for playing by foot. Adding four-on-the-floor kick patterns to solo guitar or cajon performances has never been easier. Thanks to the variety of onboard sounds and instant tone and effect adjustment using just two knobs, you can switch the sound between songs as your set progresses. It’s not limited to solo performances either; practically any musician, including drummers and DJs, can instantly access kick sounds with the SPD::ONE KICK. The SPD::ONE KICK is compact enough to fit into your existing instrument setup without needing to move your other gear. With the included mounting adapter, you can easily clamp the pad to a hi-hat, cymbal, or tom stand,* or even a mic stand. Alternately, the SPD::ONE KICK can be played without mounting it to anything at all—simply place it on the floor, a tabletop, or any solid surface. *Fits percussion stand rod diameters from 8.0-12.7 mm. You can take the SPD::ONE KICK wherever you want, thanks to its compact size and battery operation. It’s lightweight enough to be dropped into a bag or instrument case, and robust enough to travel thanks to its metal-body construction. You can even play and produce your own sounds on the move via headphones, and include them in your set list that night. Operating the SPD::ONE KICK is very simple. There are no complex submenus or button sequences—just select your sounds by turning the bank selector to any of the 12 positions, and hit the pad to play. With just four main knobs on the front panel, everything you need is at hand, including the ability to customize sounds, adjust overall volume, and balance levels on the fly. The SPD::ONE KICK is loaded with great sounds, but sometimes you just need to use your own samples. Via USB, you can import WAV audio files up to five seconds long simply by dragging and dropping your files. Your sounds can then be modified just like any of the internal sounds using the tuning and effect control knobs. If you need to use sounds longer than five seconds, check out the dedicated SPD::ONE WAV PAD, which can handle up to 4 GB of WAV audio. 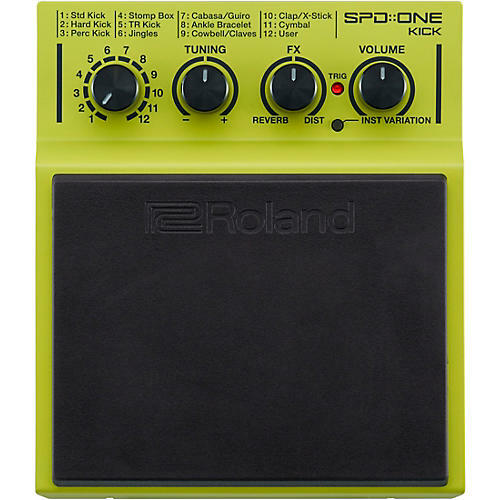 Thanks to its built-in USB-MIDI support, the SPD::ONE KICK can be used as a compact digital pad controller for a computer DAW. This provides a great way to play software-based sounds and enhance your productions with realistic MIDI percussion tracks.